April Fools' Day came a day late this year! 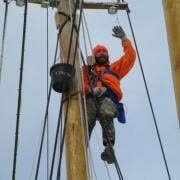 On April 2nd we started working on the Schooner Olad getting her ready for the 2013 season. We decided to begin the annual spring fitout by sanding the masts. The Weather Channel predicted 48 degrees and sunny...it was 32 and cloudy! However, Captain Matthew Ondra and our new mate Jeff Beck endured and made some real progress, while Chrissy Shyne and I worked at the varnish on the cabins and rails. It is always a great feeling when the boat work starts. It makes me realize that soon I will be out in the bay sailing. It won’t be long before I will be setting sails in the lee of Curtis Island lighthouse with friends, new and old, enjoying Penobscot Bay with me! Spring is finally here! Last week’s foot of snow is quickly retreating and the first flowers are just starting to poke out of the ground. Sailing may seem a ways off but the crew of the Olad is already in high gear getting her in tip top shape for our Friday, May 17th season opening! A special thanks to those of you who have already made plans to come back this season, we are thrilled to be a part of all of the weddings and special events you have planned. We would also like to thank the Friends Of Maine’s Seabird Islands for working with us to offer a special bird watching trip to be held July 18th. That is just one of the many special events we have planned for the season. For the complete list please visit the Special Events link on our website or give us a call (207)236-2323. I have enjoyed a wonderful ski season, but after 15 years and over 140 thousand miles on Penobscot Bay all I can do is day dream of that warm, fresh southwesterly breeze filling the sails and taking me across the bay. I look forward to sharing my passion for sailing and our beautiful coastline with you all! 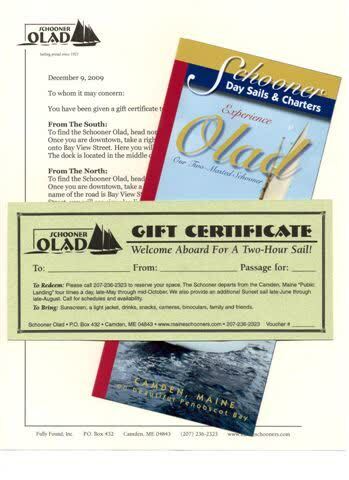 I hope you can join us for another great season on the Schooner Olad! It has been a wonderful season and some of the best sailing is yet to come. The breeze is up and the colors are spectacular. The autumn sunsets are always exceptional and the fall foliage is getting to its prime on the Camden Hills. Enjoy the colors and the crisp fall air onboard the Schooner Olad as we wind down the last 3 weeks of our season. Also, stop by our store on the Camden Public Landing for our Fall 10% Off Sale on everything in the store! As we get close to the end of the season, folks start to ask us when we stop sailing. Here is your answer! This year our scheduled closing date is Sunday, October 21st; we will be offering two hour tours at 10 a.m., 12 p.m., and 3:00p.m. for the rest of the season. Click here to make your reservation today! It won’t be long before the tall ships, the windjammers; the schooners will all be in Camden harbor. 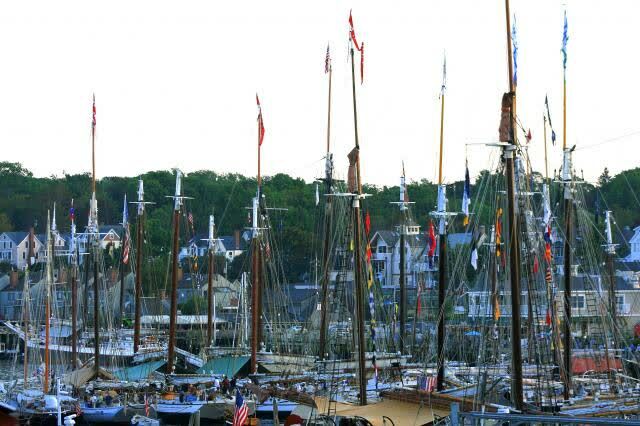 I hope everybody gets a chance this Labor Day Weekend to come down and see the “Camden Maine Windjammer Festival” and enjoy all of the activities. The fleet will be arriving on Friday August 31, 2012 between 12:00 pm and 4:00 pm. We still have some tickets available for the 12:00 pm “windjammer Sail-in” trip on Friday. Everybody will get a chance to see the boats at the dock in Camden, but only a hand full will get to sail by them with all of their sails up. Also, the Schooner Olad still has some tickets available for our regular tours, during the festival, as well. If you want to buy tickets call 207-236-2323 or go online at https://secure.maineschooners.com/reservations/new/1 . Check out the Schooner Olad in the New York Times! Join the Schooner Olad for our Sunset Sails! Our last trip of the day is by far the most relaxing and most romantic. Unwind from your day as you enjoy the calm sea breeze and the lovely scenery Penobscot Bay has to offer. Watch for wildlife, lighthouses, big estates, and other gorgeous ships. But the most beautiful thing you will see on this sail is the magnificent sunset. As you sit aboard the Olad watch the sun go down behind the mountains, the only mountain range that touches the Atlantic Ocean from here to South America. This sunset is truly unique. We also have a cushioned cockpit that will make your sail with your friends or family even more intimate. We do not provide food or drinks on the boat but there are no restrictions to what you can bring. The Captain simply doesn’t have the heart to charge $5 for a beer but feel free to bring wine and cheese or anything else you would like. Check our website or call us for times and availability. The Schooner Olad in the Great Schooner Race! Check out the Schooner Olad sailing by the Rockland Breakwater during the Great Schooner Race on July 6th! It was truly a magnificent day for passengers and crew alike! The weather has been perfect here in Camden Maine. If you are in the area why not experience Camden in a very unique and enjoyable way by joining us for a ride aboard the Schooner Olad! Join us for a Lobster Bake in Camden, Maine! If you are vacationing in Maine or if you live in the area why not participate in an enjoyable, rare, and truly Maine experience! On July 17th from 2:30-8:45pm the Schooner Olad is hosting a very special event: a half day sail and a lobster bake! Spend a relaxing afternoon aboard the Olad while she sails around Penobscot Bay. The Olad will sail through the archipelago of Islesboro to Warren Island. Explore Warren Island State Park while the crew prepares a Maine lobster bake for you and your family! Don’t miss this wonderful opportunity! The past few days have been beautiful and these sunny days are suppose to continue! While you’re in town for the Forth of July don’t miss a relaxing and enjoyable sail aboard the Schooner Olad! It is the perfect activity to do on your vacation! Also, we have a special half day sail and lobster bake coming up on July 17th! The Schooner Olad will sail around Penobscot Bay and through the archipelago of Islesboro to Warren Island. Spend time exploring Warren Island State Park while we prepare a traditional Maine Lobster Bake for you!